Pioneers in the industry, we offer coating machine from India. Gained from the long years of industry experience, we are engaged in offering a wide range of Coating Machine. Offered products are manufactured by our experienced professionals in compliance with the industry laid standards & norms. 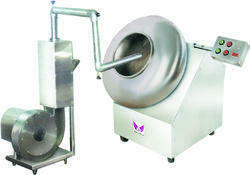 We manufacture our tablet press machines in different size specifications as per the specific needs of the customers.